US Bank Washington Court House Branch recently donated $2,686 to Community Action of Fayette County. Pictured are Steve Creed, Bill Davis, Austin Mick, Bambi Baughn, Cam Marsh, Tina Dahmer and Angela Siler. The mission of the Community Action Commission of Fayette County is to combat causes of poverty, expand community service, and implement projects necessary to provide services and further community improvements. The mission is also to consider the problems concerning youth, adults, and senior citizens and deal with the prevention and solving of those problems. The provision of affordable housing is a specific purpose of the agency, as is the development of income-generating projects consist with the purpose of the corporation which will increase funds available for service and reduce the agency’s dependence on public funds. 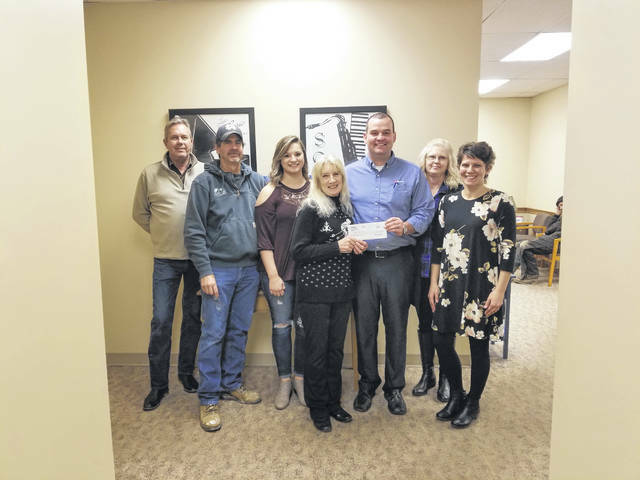 https://www.recordherald.com/wp-content/uploads/sites/27/2019/01/web1_Fayette-County-Community-Action-Donation.jpgUS Bank Washington Court House Branch recently donated $2,686 to Community Action of Fayette County. Pictured are Steve Creed, Bill Davis, Austin Mick, Bambi Baughn, Cam Marsh, Tina Dahmer and Angela Siler. The mission of the Community Action Commission of Fayette County is to combat causes of poverty, expand community service, and implement projects necessary to provide services and further community improvements. The mission is also to consider the problems concerning youth, adults, and senior citizens and deal with the prevention and solving of those problems. The provision of affordable housing is a specific purpose of the agency, as is the development of income-generating projects consist with the purpose of the corporation which will increase funds available for service and reduce the agency’s dependence on public funds.